The exhibition Inventing Abstraction, 1910-1925 is on view at New York's Museum of Modern Art through April 15, 2013. For further information, consult the MoMA website. Heads of state and their diplomatic corps know all too well how negotiations among nations can often hinge on so seemingly small a detail as a single prefix to a word. Shouldn't the most authoritative of our cultural institutions be as mindful of the language used in representing the history of international art, especially a history in which mitigating the injuries historically wrought by political and cultural colonizations still within memory are required to facilitate a new global civilization eager for crosscultural exchange? I'm referring to the title of the Museum of Modern Art's current exhibition, Inventing Abstraction, 1910-1925. It may seem a benign choice of words to Europeans and Americans who have been educated with little orientation to our former roles as colonizing nations, but to art audiences from the myriad nations with whom we are building the new global agora, the title conveys a dishonest attempt to sell the world on a genesis of abstraction that is entirely a modern European enterprise. How much more historically accurate and relevant the show's title would have been had the curators added two small letters--the "Re" of Reinventing Abstraction. After all, the show's curator, Leah Dickerman, and assistant curator, Masha Chlenova, both from MoMA's Department of Painting and Sculpture, did the right thing in entitling a listening gallery for modernist European music, Reinventing Music. The intent is clear. 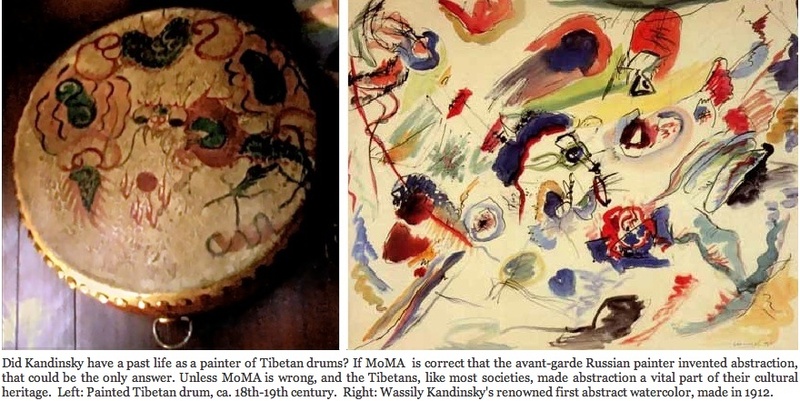 MoMA is sensible enough to concede that music existed prior to 1900, but by implication then seems to dispose of all sense in asserting that visual abstraction did not. 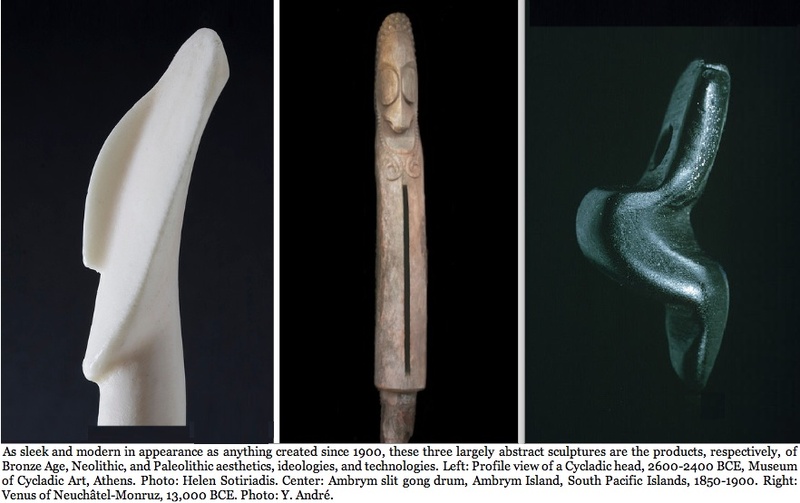 More to the point, MoMA appears unwilling to admit that visual abstraction existed outside of Europe, let alone that it can be found on all six habitable continents for at least tens of thousands of years. How much trouble this glaring chauvinism will cause the museum and its curators is yet untold. What is telling, speaking volumes really, is the clear and intended resistance of the museum's administration to abandon the Greenbergian claim that abstraction is a European and modern invention. That's Clement Greenberg, the American art critic who championed the Abstract Expressionists, the first great American school of modernist art, while denying the movement referenced any of the historical and global sources that many of the artists--Jackson Pollock, Franz Kline, Mark Rothko, Sam Francis, et. al.--claimed to have inspired their art. As late as 1980, this kind of proclamation could still be called ill-informed. Today, it is outright belligerent. There can barely be an educated admirer of art alive today who doesn't recognize that abstraction is so ubiquitous that it escapes our notice when lacking the focus to seek it out. 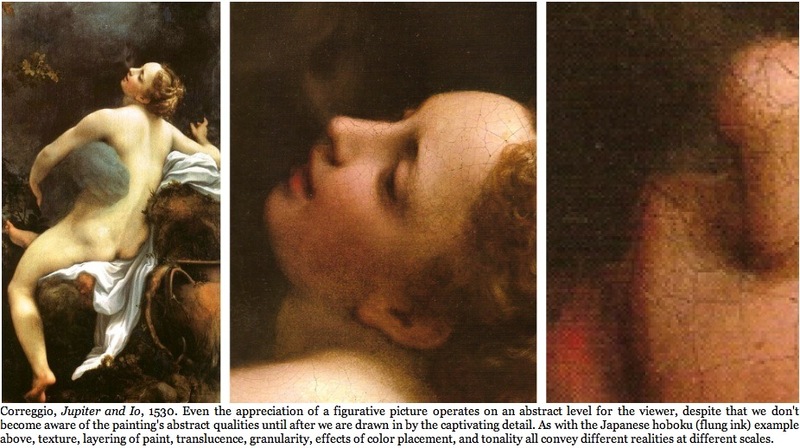 It should also be pointed out that the only reason that modern Europeans came to isolate and thereby pronounce the features of abstraction is because some five centuries earlier, Europeans (and some other classical cultures, such as China and Japan) began to distinguish between art and artifact in ways that "elevated" the art of mimicking the appearance of nature in pictures and sculptural embodiments above the more utilitarian crafts--thereby separating painting and sculpture from the creations within which abstraction, as both a practice and a principle (however unconsciously realized), remained integrated. What is neglected here is the history that tells us how nations and civilizations were significantly shaped by ideologies that arbitrated the way in which images are approached, developed, and perpetrated as significant representations of their cultures. 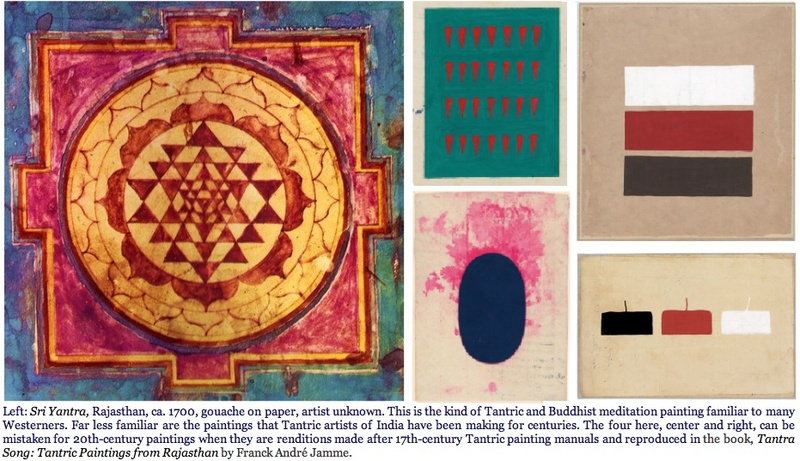 It is no small historical matter that Judaism, Islam, certain sects of Christianity, Buddhism, Jainism and Hinduism, as well as numerous classical and tribal societies, proscribed the use of naturalistic images, which then compelled those societies to channel the cultural curiosity and expression of its artists through systems and forms of abstraction--abstraction often deemed to be sacred and representative of the authority overseeing it. The greater history of Western art from Spain to India, and from the time of the art of the Bronze and Iron Ages in Judea and Samaria up until the Enlightenment in Europe, in one way or another responded to The Second Commandment as written in Exodus 20:4: "You shall not make for yourself a graven image or any likeness of anything that is in the heavens above or in the earth below." 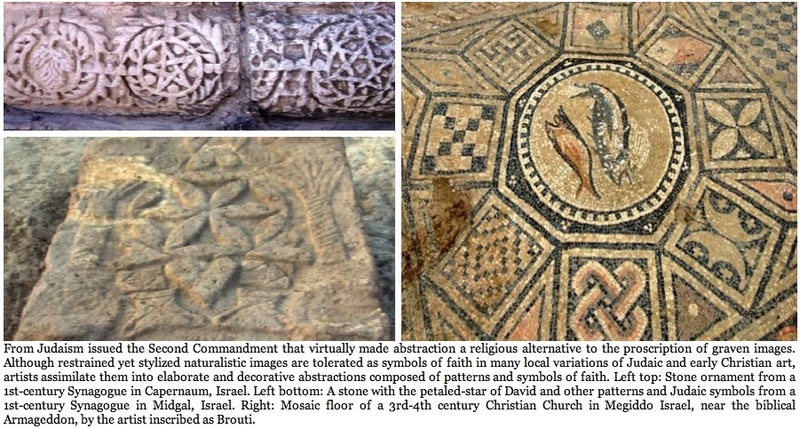 Centuries of varied interpretation of the commandment yielded abstractions conveyed through patterns and symbols that dominate centuries of artistic and architectural designs. Which makes it mind boggling to comprehend that MoMA would represent its signature early vanguard collection with a title and premise not only frought with eurocentric myopia and hubris, but which is historically incorrect. Abstraction is the basic principle underpinning the production of all art--however literal and pictorial, formalist and conceptual. 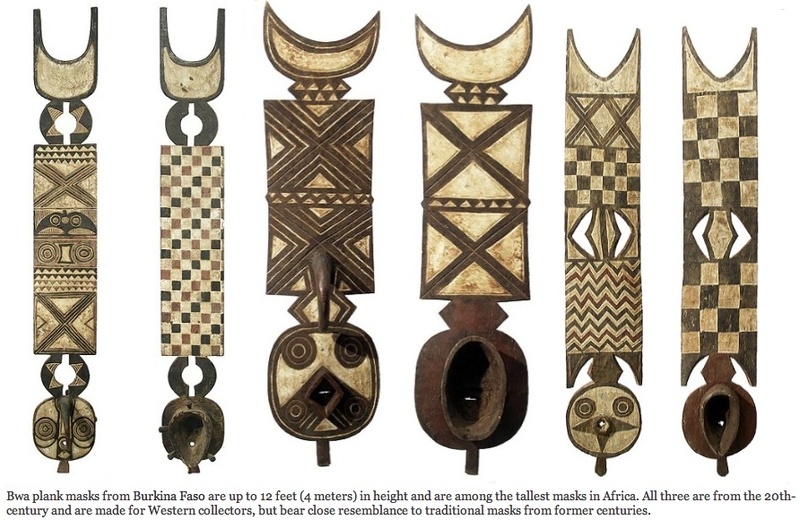 Its "invention" is now thought to have occurred at least over fifty-thousand years ago, as it can be said to have originated spontaneously as much in Africa as in Asia as in Australia as in America as in Europe. Surely the curators are aware of what anthropologists and ethnologists have been telling us for a century--what the School for Advanced Research of Human Experience in Sante Fe a few years ago pithily summed up as our debt to the abstraction of the ancients: "Over several millennia, something more traveled from the inner mind through the artist's hand to cave walls and rock surfaces. Along with familiar images of game animals and fearsome predators we see abstract symbols--curving lines and meanders, stars, and an astonishing variety of spiral forms. 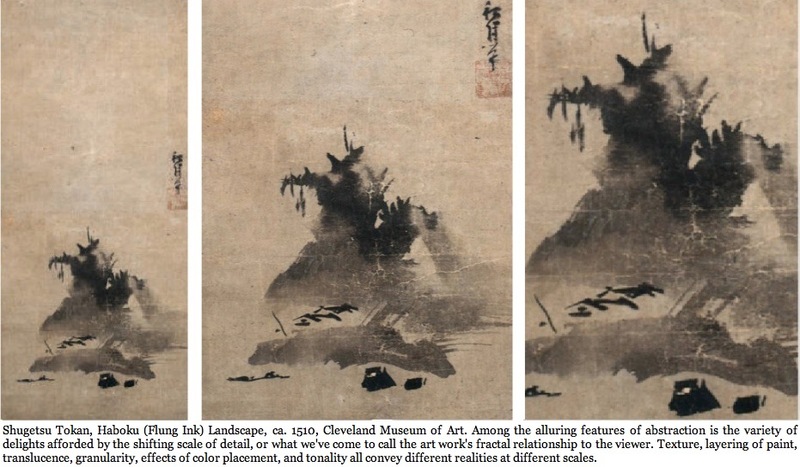 The real-world inspiration for this 'art' eludes our full understanding, but most scholars agree that the capacity for abstraction was part and parcel of human attempts to map the natural and supernatural forces that shaped their days--whether those forces resided in the arc of a night sky or in the swirl of water descending into a deep pool." It's not just the anthropologists and ethnologists who have been taking note of the origins of abstraction. In the 1980s, a voice of dissent against modernist eurocentrism was beginning to be voiced. In 1988, Thomas McEvilley, a contemporary art critic and Greek and Indian classicist, published his essay "Seeking the Primal Through Paint: The Monochrome Icon," in which he argued that the European modernists "were not the first to demonstrate that art can survive without representing recognizable objects, persons, and places." 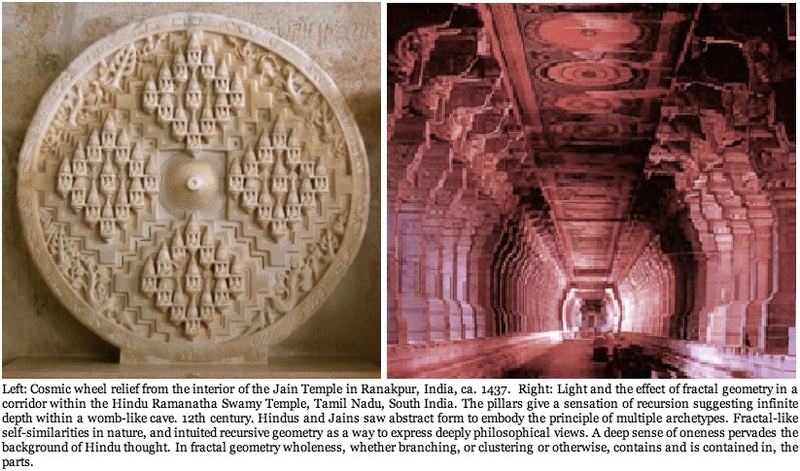 They were "preceded by the abstract artists of the Paleolithic, Neolithic, and Bronze Ages and by later Tantric and Islamic artists who eliminated this type of representation in favor of abstract quadrature, heraldic symmetry, monochromy, and so forth. In fact, abstract painting is a practice that precedes our species; the earliest known example are Neanderthal finger-paintings. This historical quibble is important because it points to a significant set of omissions in the Greenbergian argument - and the reason for the omissions is not far to seek: in these older traditions, content was read comfortably from abstract form. The works produced by these pre-modern abstract artists are widely interpreted as representing ideas about the nature of the universe." 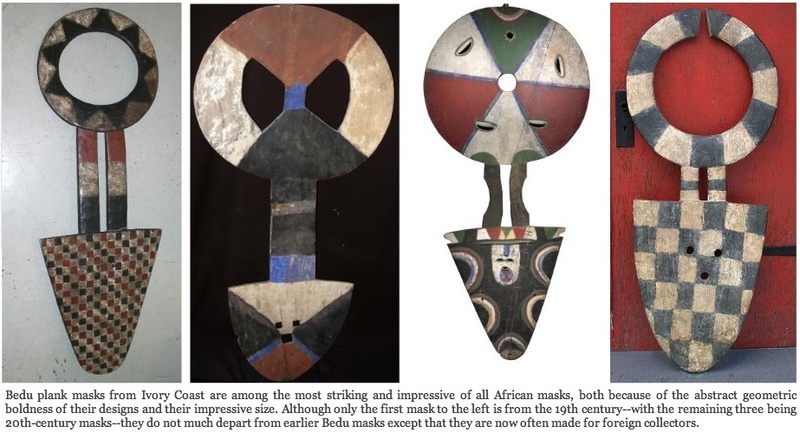 With the weight of such ubiquitous archeological and anthropological evidence and consensus supporting the global origins of abstraction, how can any cultural institution persist in framing abstract painting, sculpture and decoration as peculiarly European and modern without being accused of willfully propagating cultural colonialism? Of course the battle lines were drawn centuries ago with the hostilities between peoples of different ethnic origins. But in recent decades, many of us in the arts sought to erase, or at least blur, those lines. Now MoMA, whether carelessly or intently, draws those battle lines again. The problem has nothing to do with the selection or quality of the work exhibited at MoMA. In fact the exhibition could hardly consist of a more superb selection of groundbreaking paintings and sculptures from the most celebrated collection of modernist art in the world. Represented are Vasily Kandinsky, František Kupka, Francis Picabia, Robert and Sonia Delaunay, Marsden Hartley, Marcel Duchamp, Piet Mondrian, Kazimir Malevich, Georgia O'Keeffe, and scores more whose names emblazon the canon of Western modernism. 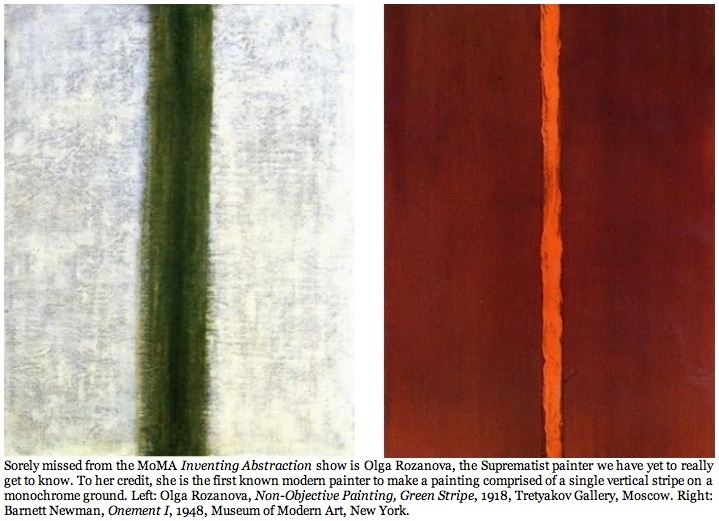 Sadly missing, but understandably, since she left so little work in the wake of her young death, is the Russian Suprematist painter, Olga Rozanova--whose 1918 vertical green stripe painting preceded the much revered stripe paintings of Barnett Newman by thirty years. What was invented between 1910-25 was a new context for abstraction, not abstraction itself. Furthermore, abstraction is not something confined by media. 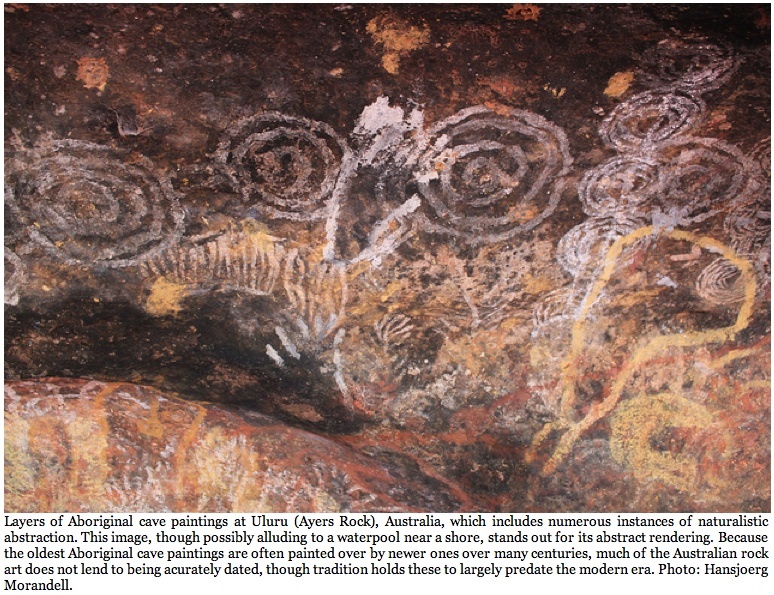 Abstract painting on canvas may be relatively new, but abstraction in sculpture, weaving and ceramics, architectural ornament, ritual objects, and especially cave and rock petroglylphs and pictograms, date to tens of thousands of years. Those that can be called both formally and conceptually abstract, though rare, are no less found among the Neolithic and Paleolithic sites uncovered over the six continents our homos sapiens ancestors inhabited--and now feasibly homo neanderthals, too. Even if such creations were largely functional and ritualistic, they were no less conceived and produced with an aesthetic sensibility, if not a principle, in mind. As for the highly opinionated notion that premodern art has its function of decoration separating it from the art of modernism--an art designated as being for art's sake alone--we can argue that there is no such thing as the mythical "art for art's sake". There can only be art for the sake of humans, and thereby its aesthetic purpose is common with the decoration and architectural ornament, textile or ceramic vessel, possessed equally of function as of aesthetic gratification--and making it no less representative of abstraction as a painting or sculpture devoid of function. We are wise to keep in mind that Europeans were impelled to create the "art for art's sake" myth around 1900 because Europeans had some five hundred years earlier devalued the former context for abstraction--that equating painting and sculpture with functional crafts and artifacts--a context which up until about 1400, Europe shared with the rest of the world. Europeans, with their new science of pictorial perspective and their newly unearthed humanism, sought to elevate its own artistic production above the craftsmanship of artisans in a way that had never been previously asserted. Whether intended or not, the abstractions that characterized more utilitarian forms gradually became devalued by comparison. The conceit that Europeans had created a "high art" in painting and sculpture unlike any the world had ever before known, took hold--but took hold in Europe alone, and four centuries later in North America. It certainly is a conceit to qualify painting to be an art form "higher" in quality and standard than weaving, pottery, or architectural adornments--all items from which figurative painting copied, and from which abstract painting had later derived so many of its designs and, more pertinently, its origins. A private preference for flat painting without content is subjective. A public proclamation of such painting as somehow more "advanced" is culturally, if not ethnically and racially, narcissistic--a self-serving stratagem to empower (and disempower) artists and their advocates on the basis of their aesthetic affiliations. Museums are public institutions poised for the advancement of knowledge of the arts, but they are also holdings of art often purchased and donated by trustees with much to gain from their contributions being lauded above the holdings of other trustees at other institutions. Often the art that trustees and the curators who represent their holdings in exhibitions and collections value, is truly noteworthy and supported by a consensus of professionals with wide exposure to the art of the day. But that doesn't make the consensus of the moment any less prone to a bias shaped by ethnic, ideological, and political relationships. In the late twentieth century, art criticism and art history exposed much of the prejudice within its canons. But though the range of art that has since the 1980s greatly diversified public exhibitions with contributions made from around the world, the resistance to non-Western contributions remains steep, as the current show at MoMA demonstrates. It is for many of us who were adults in the 1980s deja-vu all over again--and I insinuate that with all the fatigue that the 'deja vu' cliche carries. 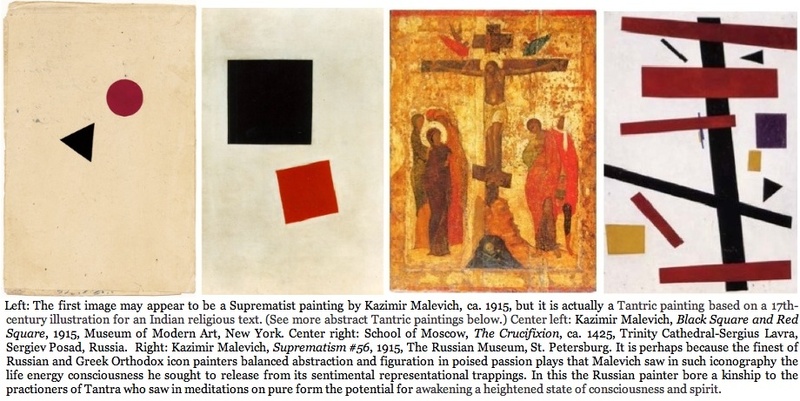 MoMA was the catalyst for the activism against eurocentric values which can be more or less pinpointed to 1984, when MoMA's director of painting and sculpture, William Rubin, and his then-protégé, Kirk Varnedoe, mounted the soon-to-be-infamous Primitivism Show. It was a show where the lessons of postmodern and postcolonial critics and cultural activists came at its curators from all sides to challenge, once and for all, the eurocentric notion that Modernism begins in Europe. And for three decades it seemed that MoMA, like most of the eurocentric institutions of art, learned a lesson from that convergence of dissent--a lesson its curators apparently hadn't learned in the art departments of Yale, Princeton and Brown at that time--though it might have in their Cultural Studies departments, which shows just how lagging the once-avant-garde art world had become. 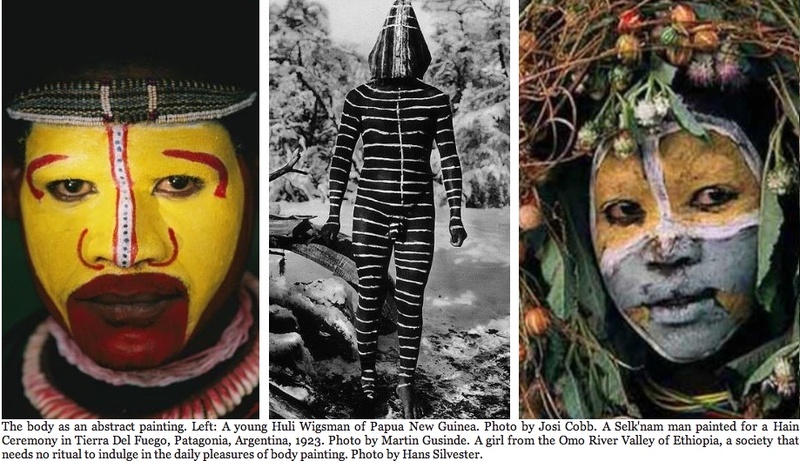 The Primitivism show nakedly represented the sensibility that the victors wrote the histories--in this case the art history that predominated in a pre-globalist art world. But the activism that swelled up to a pitch eclipsing the exhibition left modernists embarassingly aware that eurocentric claims for art were but local histories, often expressed in regional languages, values and myths, and as such were not subject to global consideration, and never invited consensus. Many of us who wrote criticism and theory in the late 1980s and 1990s, especially those of us who advanced nomadic or multicultural criticism that included and explored the world's diverse artistic productions, thought that diversity was winning (though hardly had won) the day. But the exceedingly diverse art from all over the globe that has flooded the art world since 2000 reinforces that view. So why, nearly thirty years after suffering the humiliation of the Primitivism show's glaring shortcomings, does MoMA seem so intent on reinforcing their former reputation for cultural blindness and retrograde aesthetic principles? Principles which expose MoMA's anachronistic exhibition policies as old-guard entrenchment in the colonialist culture of white Europeans and Americans over the cultures of the colored peoples that the Europeans and American powers once claimed dominion over? We all know that overt governmental colonialism has seemingly "disappeared." But we also know it has been replaced by a corporate colonialism that has investments the world over fully exploitive of indigenous communities and their resources. I certainly can't say that the curators at MoMA invest in or politically align with them. But we can all see by this eurocentric persistence to disavow abstraction of its global and ancient origins that the curators are either insufficiently aware of how retrograde their view is, or simply find that their hands are tied by a museum administration out to serve its trustees. What else explains the inability to address an issue so explicitly relevant as the global origins of abstraction--origins so visible in the cultures the world over? What else but an attempt to reassert the discourse that supported colonialism. The insistence on calling painterly abstraction in Europe an "invention," and not the derivation it is (or, should we choose to be less kind, the pirating many non-Westerners and Westerners alike see it to be), is colonialism rearing its ugly head. But perhaps we should be grateful to the curators for their Freudian slip. If the MoMA Primitivism show unintentionally served as a call to arms for the world's culturophiles to assert that a once-victor nation can no longer dominate history to the point that even its historic cultural victories are called into question, the Inventing Abstraction show, with its online networks visually reinforcing the lie of eurocentrism, blunders staggeringly in betraying itself by indicating just how much more we have to go before the former colonial nations yield to the former colonies and subjected peoples in terms of the diversification of historical scholarship and opinion. And really, all we have to do is look back at the criticism leveled at MoMA in 1984-85, particularly that formulated by Thomas McEvilley. In 1996, I published my commentary on McEvilley's role in the debate with MoMA in the book Capacity: History the World and the Self in Art Criticism. It includes republished essays by McEvilley that had first appeared in Artforum in the 1980s, and then in his two books, Art and Discontent: Theory at the Millennium (1992), and Art and Otherness: Crisis in Cultural Identity (1993). McEvilley was by no means the only critic of eurocentrism in the art world, and he certainly wasn't the first when counting the expanse of Left cultural and ethnographic studies. But along with art critic Lucy Lippard, whose view was more politically and humanistically generous than historically oriented in its argument, McEvilley's counts among the earliest art world accounts calling for a dismantling of the false "qualitative" divide between art and craft--a divide that heretofore had reinforced the view that abstraction was a European invention--and was the only basis for European claims to abstraction. McEvilley was certainly the most widely published and read advocate of the new global study and exposure of world art, which included the many origins of abstraction at odds with the eurocentric accounts. But then McEvilley's recourse to global history--and not just the myopic history of Europe--made him keen to recognizing the omissions of earlier modernists--Clement Greenberg, Michael Fried, Sheldon Nodelman, Susan Sontag, Suzi Gablik, and the early work of Rosalind Krauss--who together represent the claim that humankind had never before the mid-20th century so perfectly realized such pure, abstract form. McEvilley waged a powerful argument against this claim, citing the producers of imagery in the Paleolithic, Neolithic, and Bronze Ages and, millennia later, the artists of Tantric and Islamic systems, as having successfully eliminated representational elements from their productions. He thereby exposed and weakened late Modernism's implicit conceit that abstraction and formalism were the intellectual pinnacles of a linear and progressive Western civilization. No doubt I was naive in 1996 for believing that the eurocentrism of the centuries was being pulled away like a curtain to reveal the depth and wealth of diverse artistic productions of the world. Which is why I then wrote in Capacity, "Once the purity of art is abjured as a dishonest and authoritarian myth, we contend with art's relationship to the viewer--it's theatricality--and from that, the size, character, and patronage of the theater it is presented in." Many of us thought it was the end of the legacy of Clement Greenberg, whose authoritarian thought led us to one of the 20th century's most famous cultural dead ends--and that's what all tyrant's do: lead us to points where thought closes off. As the art on the cusp of the millennia has shown itself to be of a great and changing capacity for its diversity, especially art of the global arena, criticism can only keep apace if it does not bog down in central ideology or static systems. No world civilization or pre-civilization is considered ill-worthy of citation alongside the formidable Western canon of masterpieces and modern contexts so long as the comparisons are relevant and respectful to the fair-minded formal strategies and conceptual rationals of both sides of the relationship being newly forged. In this capacious exploration, the articulation of form's relationship to content are shown to be handled with an astonishing variety and availing itself to new and unforeseen contexts both today and in the future. Yes, the MoMA curators are correct in seeing that we retain much of value from the artists of the 19th and early 20th centuries, but we do so at the same time that we see that the abstractions of those centuries are but representative of the West's rediscovery of the myriad employments of abstraction (and other cultural motifs and processes) in the world--be that a rediscovery of classical, tribal, even prehistoric forms. 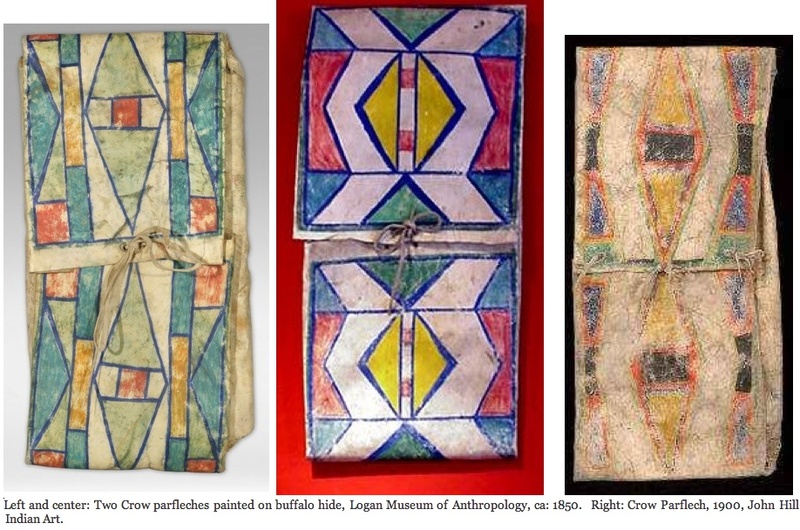 We need only look back to the enthusiasm of the European and American Modernist generations over their discovery of the non-European traditional and indigenous formal strategies that they appropriated and synthesized in their own productions. The list of origins is famous and includes the Japanese ukiyo-e print makers of Edo Japan; the ornament, script and architecture of medieval Islam; the sculpture, painting and crafts of Sub-Saharan Africa. 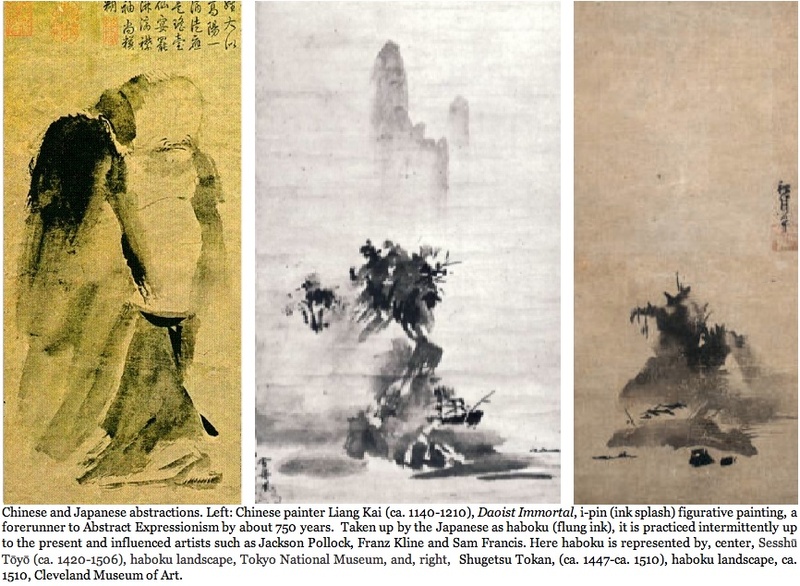 It includes Tang and Sung dynasty scroll paintings--which include the first known invention of "flung-" or "splash-ink" painting techniques that were the forerunner to abstract expressionism, and are known as i-pin in China and haboku in Japan. 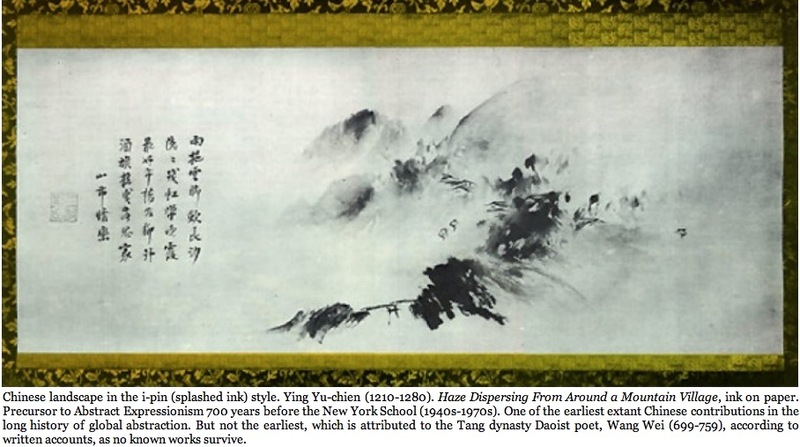 Also counting among the abstractionist arts are the Taoist painting manuals of the 17th century and the art and rites of Tantra and Yoga. The most capacious critics and art historians from the 1980s on (though not always the most stylish or renowned in terms of art market trends) expanded the principles and histories of art to include world cultural influences even in the estimation of contemporary Western artists. No doubt the shift has often been confusing and controversial in incorporating the convergence and collision of styles and ideas that compete for the attention of viewers globally. But clearly the path has been reset with a compass aimed at achieving a cultural capacity that sees beyond the shortsighted visions of contemporary fashions and markets. Historical learning in particular can only be as capacious as required if it is honed with a "sensor" of connections and discontinuities across space and time. As art spanning the cusp of the new millennium is one of great and changing capacity, especially art of the global arena, art history and criticism can only keep apace if it does not bog down in regional ideologies or static systems. We today require a changing, responsive criteria, one often called "culturally nomadic," which is adept at facilitating our entrance and egress of models from diverse origins--be they local, national, ethnic, religious, scientific, gender specific, or personal. We require this nomadic sensibility so to critique any art form or discourse we encounter anew while remaining mindful of the criteria it has apparently established for itself within the culture of its origin and making. No doubt vital and world-class exhibitions can still be mounted while telling us new things about the development of abstraction in Europe. But no longer can such shows afford to foster such a failure of insights into the crosscultural and historic boundaries as that exhibited by the curators of Inventing Abstraction. And this especially given that we know that artists such as Manet, Van Gogh, Gauguin, Picasso, Matisse, Kandinsky, Ernst, Kahlo, Rivera, Siqeros, O'Keefe, Avery, Pollock, Kline, Rothko, and scores of others throughout the modernist century, studied the art of cultures outside Western modernism. Since the passing of those earlier generations, artists for the past four-to-five decades have expanded the framework within which we shift art world interests away from false universal principles, which really are representative of only one local consensus (albeit, in Modernism, a geopolitically large and powerful one), and turn them toward a far more expansive global understanding of difference. This includes reframing the ancient issue of form versus content, that, though was central to the European development of abstraction, has since become outmoded and surpassed by the altogether more capacious issue of art's context. Defined as the intersection of cultural circumstances and environmental conditions variously giving rise to specific thought and production, context is thought in general today to determine how form and content will relate in each given case. This really isn't that new of an idea; the form-content debate goes back at least to Plato, and something akin to the notion of context has been raised at various times in that legacy through the use of ordinary words like "intention," "circumstances" and "conditions," or special connotations of "history," "culture," "nature," and "the environment." But though these terms referred to the ways that an object is made or interpreted, they rarely if ever implied, as context does today, a relativistic determination of the ways in which form and content relate to each other. For form and content were thought traditionally to be governed by absolute and universal principles--whether or not we agree with that view today. For the relativist, context has taken the place of the universal principle or the objective world. Context is capacious, the arena in which all the people of the world project their subjective interpretations of form and content and receive the projections of others onto them. Context is the arena that links subjectivities, not in an objective frame, but in an overlapping and ever-permuting procedure that has no definite shape or metaphor with which to describe it. Context, then, is intersubjective: it is the product of the vague but commonly understood agreements of how to define the world and of what subjectivities overlap significantly enough to function in, and be represented as, conventional reality. The importance of context as a mediator of form and content has been promoted and assimilated even in models that purport to have an objective and stable framework. In the objective model, context simply represents a slice of the objective world that is experienced in one way by some and in other ways by others; even here it functions relativistically, as it is the part of the world that defines, or is defined by, a local population of a specific time. The important thing to know is that context is generally agreed to determine the way that form and content become manifest. 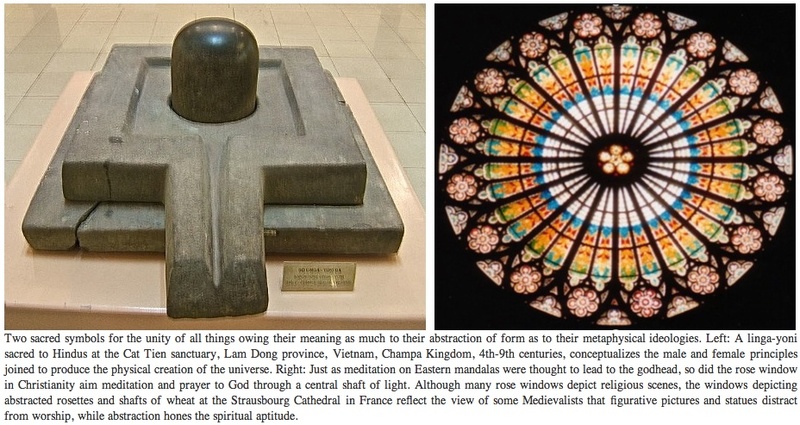 In other words, aesthetic objects are determined by the way in which specific societies in specific locales designate how to fit form, content, and function together in a way meaningful to them. The true global context (not to be confused with the corporate, homogenizing globalism being imposed on world cultures today) defies the narrow view of the European formalists who tried vainly to root all specific events and behaviors in an universal ground that was unchanging and absolute. The relationship of form to content cannot be explained by universal principles because that relationship is different from case to case and thus requires a relativistic and practical approach to the interpretation and analysis of each case. Reframing the form-content debate in the light of context, we see that the different ways that form and content recombine do not imply that they must reconcile with some guiding and universal standard of harmony, but rather in coming to terms with the contingent values and functions established for form and content by the general consensus of authorities that prevail in given societies--be those societies tribal, national, or comprised by civilization. For through artists' referencing of cultural models from around the world, viewers and readers get an immediate and direct idea of how much more liberating it is to capaciously represent and experience the world's heterogeneity.